There were mixed emotions from paralympian Oscar Pistorius's supporters this morning, ahead of his sentencing in the High Court in Pretoria. "This morning there is quite a lot of anxiety and mixed emotions," supporter Kayla Nolan said. "He must be pretty anxious this morning. To be honest, I am sh***ing my pants this morning for him, so I can't imagine how he must feel." She said there was a lot of anxiety and mixed emotions from Pistorius's supporters and the prayer group for him. Nolan has been in court a few times since the start of the trial. The 19-year-old has often gone to greet Pistorius during lunch and tea breaks. She said she is thankful for the athletes family. "Thank the Lord that he has a great family support system." Asked by a friend why media were interviewing her, Nolan said: "It's probably because I'm disabled." Veronica Theron from Pretoria North, achieved her dream of touching her hero on Thursday, and the short, salt and pepper haired 55-year-old was outside the court again on Tuesday to support Pistorius. "I got up very early. The waiting is terrible," she said. "I feel for Oscar. I think he must be going through hell, it must be terrible." She said that when she met Pistorius in court last week, she told him she was thinking of him. Theron said speaking to Reeva Steenkamp's family was emotional. "I think both families are feeling it, especially today. Whatever happens, I support Oscar." Theron was hoping the athlete would get community service. On September 12, Pistorius was convicted of culpable homicide for the Valentine's Day 2013, shooting of his Steenkamp. The court found him not guilty of murdering her. Pistorius shot Steenkamp through the locked door of his toilet, saying he thought she was an intruder about to emerge and attack him. She was hit in the hip, arm, and head. 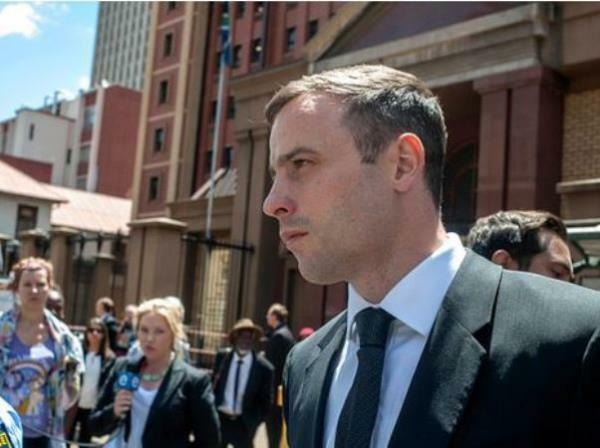 Pistorius was found guilty of firing a pistol under a table at Tasha's restaurant in Johannesburg in January 2013. He was found not guilty of shooting through the open sunroof of a car in Modderfontein on September 30, 2012, and of illegal possession of ammunition.